We have a variety of programs to meet your needs. Whether you are 3 or 103, in excellent physical condition or just starting an exercise program, we have a program for you. We invite you to come observe any of our classes at any time. We also invite you to try an introductory class with no charge or obligation. We find that you will gain a better understanding of our programs by trying a free class rather than just observing. Just call or e-mail to schedule your free introductory class. It can take time to properly evaluate a program and if you are a beginner, it can be difficult to know the difference between a good program and a bad one. It may take a month or two before you can decide if a program is right for you and your family. That is why we don't require long term contracts. You can choose from a variety of membership options so that you have little risk if you decide our program is not what you are looking for. We're sure that you will appreciate how unique we are and discover why we still have students who have been with us since we opened in 2000! We also offer discounts so the whole family can participate! Prices for members are listed below for most of our monthly programs. Please note that most of the prices listed are based on an annual membership. For a 6 month membership, prices may be $10 per month higher. Without a membership, prices may be $20 per month higher. 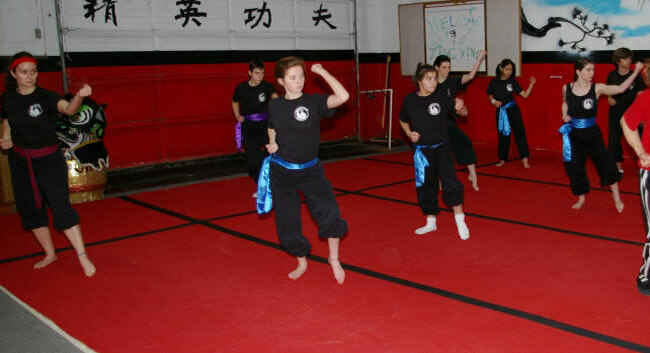 Our Kung Fu Kids program is for children from approximately ages 4 to 11. Our curriculum is focused on improving children's attention and focus, improving flexibility, strength and coordination, and building confidence and self control while learning kung fu and having fun! The Kung Fu Kids classes are taught "family style" meaning they are open to adult family members to train with their children if they like. Go to Curriculum to view a description for each of our levels. We do not teach the self-defense techniques involving qinna (joint locking) in the kids program. $125 per month for unlimited classes or $95 for up to twice a week. We teach the Northern Shaolin Kung Fu of Tian Shan Pai (天山派). This graceful, artistic, yet explosive style is a complete system that will provide you with effective self-defense techniques while improving your overall coordination, strength and flexibility. It promotes courage and determination without aggression and gives a practical knowledge of self-defense skills. We offer separate classes for beginner, intermediate and advanced level students. This allows the instructor to focus on skills appropriate for the class so students get more attention and spend more time on skills appropriate for their level. Go to Curriculum to view a description for each of our levels. $125 per month for unlimited classes or $95 for up to twice a week. We recognize that it can be inconvenient to bring in your children for the kids' program, then take them home and return later for your own class. 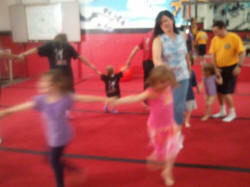 Our family program allows you and your children to take classes together! Kung Fu is a great activity for families to share and this program can give you more flexibility to help it fit your schedule. With our Kids Kung Fu classes, parents are welcome to take the class with their kids. Alternately, with an instructors approval, children 10 and older can join the regular adult classes with a parent as long as the class is at their level or below. Tai Chi, an internal style of martial arts, teaches mental focus, while emphasizing coordination, balance, relaxation, and proper breathing. When practiced properly, Tai Chi can be an effective form of self-defense. At all levels, Tai Chi is said to regulate the central nervous system and helps prevent stress, high blood pressure, and heart problems. You may also see this written as Taijiquan or T'ai Chi Ch'uan, but they are spelling variations of the same thing. This is not your standard kickboxing/aerobics class. You'll improve speed, balance, flexibility and aerobic capacity while burning fat and building core strength through the use of Shaolin training techniques. Ideal for those who have never been athletic and those looking to get back into shape. This is a non-rhythmic class so you won't have to learn moves choreographed to music and you won't have to learn forms or sparring. Instead, you'll get a program that gives you the benefits of Pilates, yoga, aerobics and martial arts training all rolled into one fitness program with lots of exercises you can do anywhere and without special equipment! Level 1 is for beginners of all fitness levels. $40 per month if this is your only class at Jing Ying. $20 per month if a family member participates in any of our monthly programs. 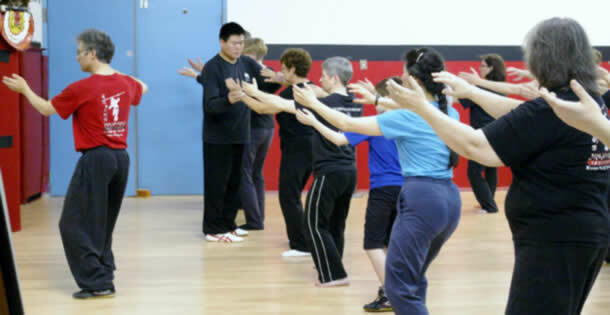 $10 per month if you are in our Tai Chi program. Free if you are in our Kung Fu program! Please note that tai chi is a type of qigong and all our tai chi classes include medical qigong exercises to train the body and promote health. On a periodic basis, we do offer classes on specific QiGong sets. This program is offered in eight week sessions of one hour classes that focus on the Ba Duan Jin (Eight Pieces of Brocade) or the Yi Jing Jing (Muscle/Tendon Change). The movements are easy to learn and are suitable for all ages and levels of fitness. They can even be performed seated. Although a simple set, regular practice will provide noticeable health benefits in just a few months. We have instructional material available in book and DVD format to supplement your classroom practice. Offered periodically during the year. Go to Qigong to register. We offer the benefits of our well structured and progressive program in a special class for homeschoolers. We will improve your strength, flexibility, balance, coordination, and endurance while teaching effective self-defense techniques in a non-aggressive environment. Kung Fu is really about learning to use your body properly. The skills you acquire will help with any physical activity you engage in. Go to Homeschool Kung Fu for more info. We provide PE classes on Friday afternoons. A low pressure, noncompetitive, but physically rigorous class that's creatively orchestrated and a lot of fun. The class combines warm ups and stretches from Chinese martial arts, tai chi, yoga, and general fitness activities followed by numerous races, games, and group activities for a one hour class that keeps them coming back for more. For homeschoolers, we will provide a certificate of participation that can be used as documentation for your PE requirement and we participate in the Presidential Physical Fitness Awards program enabling your child to receive patches and certificates. Fun for parents and children from 5 to adult! Instructor Billy Greer is a long-time homeschooling dad. Go to Homeschool PE for more info. Your child can have a Kung Fu Birthday party at the Jing Ying Institute! We will provide you with invitations, set up tables, provide 90 minutes of studio time and clean up afterwards. Your child will receive an honorary Birthday Blackbelt certificate, and we will provide an introductory kung fu class for all participants. In addition, there will be lots of fun games and activities followed by time for refreshments and cake. You provide the cake and refreshments, we'll provide the fun! Beginners with no experience in kung fu or martial arts will learn basic techniques and forms, while students with previous experience will have the opportunity to advance their skills. Tumbling will include basic balance skills such as headstands and handstands as well as working on rolls, cartwheels, headsprings, handsprings and flips. Half-day and full-day options available. Go to Summer Camp to register. Our instructors are also available for private lessons. You choose the subject matter so you can focus on the areas important to you. Some people want extra work to help them improve skills from our regular curriculum. Some people want to improve their tumbling, fighting, chin-na (qinna), tai chi (taiji) or weapons skills. Other people just prefer the one-on-one attention that a private lesson provides or the opportunity to pick the day of the week and time of the day that best fits their schedule. Hourly rates are $60 with a black sash and $75 with a shifu. If you are a public figure, an Executive, work undercover or for any reason just value your privacy, our VIP program may be for you. We won't reveal who you are or what you are studying with us. Go to VIP Program for more information. Do you want to improve your health, lose weight and get in the best shape of your life? If you are looking to bulk up or become a bodybuilder, look elsewhere. But if you are a man, woman or child interested in increasing your lean muscle mass, functional strength, cardiovascular capacity and flexibility, we can help you with your goals. Whether it just losing weight and improving overall fitness or developing attributes to prepare for competition in a specific sport, we can work with you to create a personalized program to achieve your goals. Too many other programs can make you "fit" without being healthy. We have certified personal trainers who can help you put health first and help you learn to use your body correctly. We teach you skills to use for a lifetime of being healthy and active. You won't need a lot of specialized equipment or a lot of space, so you can practice what we teach you at home. We offer a variety of options for programs that can be offered at your offices, at our facility or at another location. Whether you want a one-time workshop or ongoing classes, we can help you provide your employees with the perfect program for personal protection, health and fitness, or relaxation. Our demo team had performed for museums, schools, government agencies, clubs, churches, businesses and individuals. Our performances are suitable for grand opening celebrationss, for scout banquets, for fundraising activities, weddings, birthdays, or any occasion that you want to make unique and memorable. A Lion Dance can add that special touch that is sure to attract attention with the noise, bright colors and spectacle of the high energy performance. Add in Kung Fu forms and weapons and you'll have an exciting event that won't soon be forgotten! Whether you want to fill 5 or 10 minutes with an intense, high-energy Lion Dance performance, have an hour of exciting Kung Fu and Lion Dance, or provide a soothing interlude with a Tai Chi demonstration, we can help with your event. Just contact us with your date and time to check our availability.